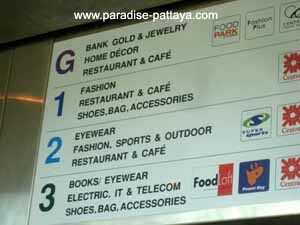 If you like shopping you will like the Central Festival Pattaya. This is a shopper's heaven and there is a lot more you can do besides "shop till' you drop". I hate shopping as most men do but I do visit the Central Festival in Pattaya at least once a week. 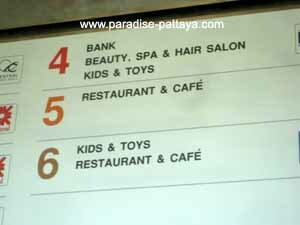 Sometimes only to take a ride up to the sixth floor in the glass elevator on the Pattaya Beach road side. The view from up there is just amazing. The picture on the right has been taken from inside the glass elevator on the Pattaya Beach road side of Central Festival. 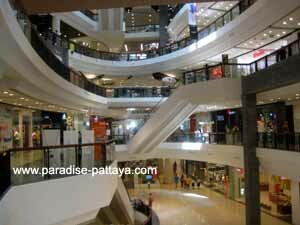 Central festival in Pattaya is a great shopping mall, is in a great location between Beach road and 2nd road, and has just about anything to fulfill your shopping needs. There seem to be people complaining about increased traffic back ups on Beach Road but I believe most locals and expats are happy about the mall. If nothing else it makes a great place for a walk in an air conditioned area. The mall is very spacious and I believe many expats are using it for their daily "stroll in the park". 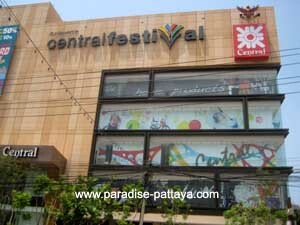 Central Festival in Pattaya opened on 23rd January 2009. The day when Pattaya also had their first International Mardi Gras, also called electric carnival parade. The Mardi Gras was a success and was enjoyed by many locals and Pattaya Visitors and was organised by Pattaya City Hall in partnership with TAT and private business sectors. The CentralFestival Pattaya on Pattaya Beach Road is Thailand's largest beachfront shopping complex and lifestyle destination in Thailand. 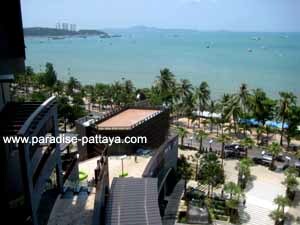 The complex extends 111 meters of beachfront in Central Pattaya on Beach Road. The giant complex is 240,000 square meter, featuring a entertainment facility, five-story Central Department Store, more than 370 international retailers and several beach-themed restaurant and bars. The entertainment complex has 16 lanes of bowling alleys and ten cinemas. The restaurants and bars there serve a vast array of fresh seafood and Thai cuisine. Pattaya is Thailand's premium tourist destination and Central Festival Pattaya will help attract more upmarket visitors said Khun Kobchai Chirathivat, President and CEO of Central Pattana Public Company. It will become the leading shopping complex and largest and most vibrant premium lifestyle center in Thailand's eastern region.